Last Sunday we woke up to what seemed like the umpteenth day in a row of gray skies. I love gray days...but they had been around for so long at that point that even I was tired of them. I just wanted to hole up in the house with a book....and put on a big pot of soup for dinner. I didn't even want to go to the store, so whatever soup I made had to be something that could be made with things I had on hand. Fortunately, my pantry is well-stocked with winter storage vegetables from my famers' market right now. Cabbage, turnips, sweet potatoes, winter squash, onions, garlic, leeks... Not to mention my regular staples of cured meats (bacon/pancetta, prosciutto/ham)....and a couple varieties of dried beans. I even had some stock on hand. (Although, I am not afraid to make my soups with water, so lack of stock would not have been a deal breaker...I would have just added more onion and/or leek to the soup.) Knowing I had the makings of soup on hand I decided to put some beans on to soak (using my modified quick soak method) and wait until later in the day to think about exactly what kind of soup I was going to make. 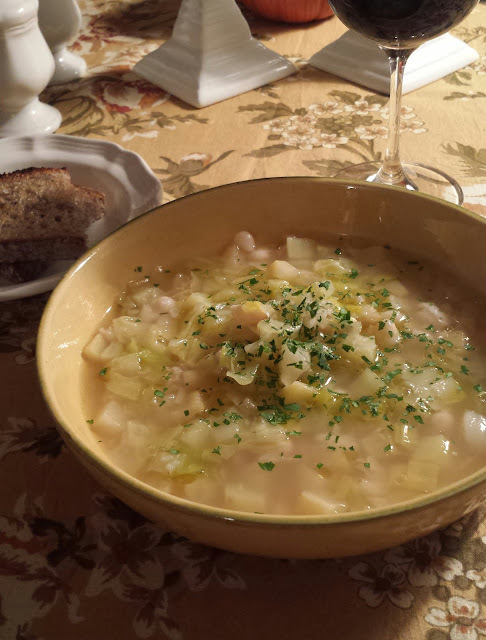 As I considered what to make, the presence of the cabbage and dried beans in my stash put me in mind of a classic hearty soup-stew from the Southwest corner of France (the Landes, the Béarn and the Pyrénées) called Garbure. In addition to cabbage and beans it typically includes one of the famed preserved meats of the region—duck, goose or pork confit, along with the gelatinous broth produced by the confit process (sometimes called "duck/goose jelly"). Unfortunately I don't live in the south of France so these things aren't to be found in my working pantry. But rich meats and broths do not have to be included in a Garbure—there are many versions that are made with a simple broth or even a combination of water and broth. The real hallmark of Garbure is the cabbage. 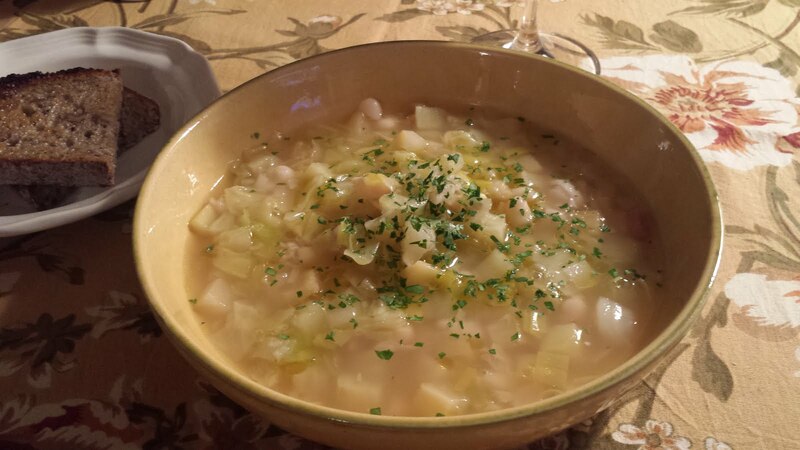 The remaining vegetables that are included in the soup are those that would be abundant on the farm during the winter months—leeks, onions, potatoes, turnips and carrots. If you shop at your Farmers' market, these will be the things you will have too. Traditional versions of Garbure are said to be so thick that a wooden spoon or a ladle will stand erect when thrust into the center of the soup. This thick mixture is then ladled into individual bowls over slabs of brown bread (in much the same way Americans sometimes serve Ham & Bean soup ladled over a chunk of cornbread or a split biscuit). The soup I made for our dinner was much lighter and broth-y than these traditional Garbures. I didn't add any starchy white potatoes, which tends to thicken a soup (and is particularly noticeable in successive reheats). Furthermore, I added a higher proportion of liquids than is probably typical. The vegetables you use when you make Garbure are up to you...as long as they are winter vegetables. I liked the idea of an all white/cream/pale yellow/pale green soup, so I didn't include any carrots...or orange sweet potatoes or winter squash. All of these would be at home in this soup, but I happened to have some white sweet potatoes (Bonita) from my market, so I chose to use them and forged ahead with the idea of a monochromatic soup. Potatoes would obviously have been fine, but as mentioned above they add thickness, and I really wanted a lighter soup. I also added leeks and turnips (some lovely Goldball turnips...but classic white, purple top turnips would be fine). 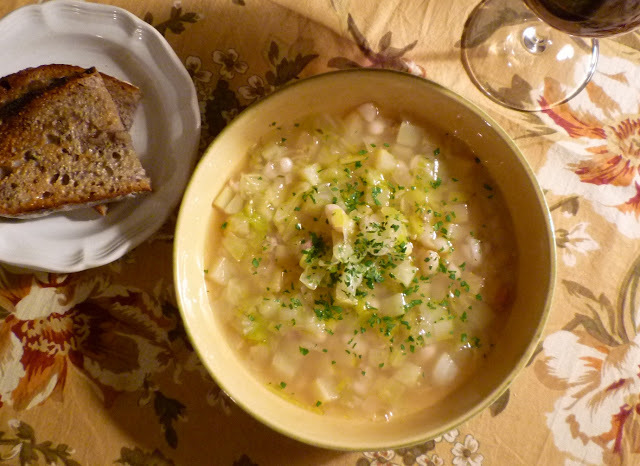 I could have included celery—adding them to the soup with the leeks and onions—but just chose not to. As you can see, this is a homey, flexible soup. 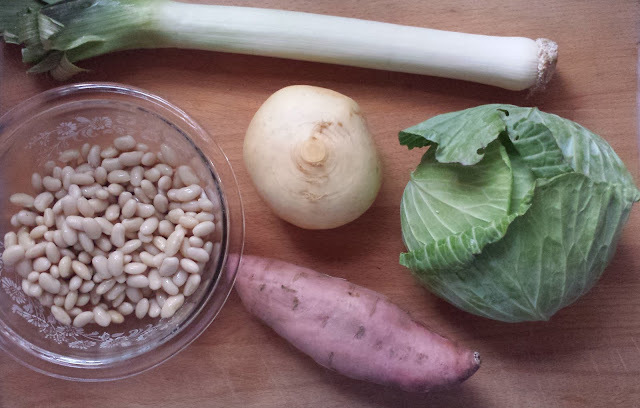 For the given quantity of cabbage and beans, four or five cups of additional vegetables is about right. Water/stock/bean cooking liquid can then be added to achieve the body and thickness that you prefer. After I made my soup I realized that it would make a perfect post-Thanksgiving soup... if you happened to be the one who roasted the bird. Chunks of dark meat...along with a dose of any of the salty pan drippings left from the roasting process...would make fantastic stand-ins for the traditional duck or goose confit and accompanying "jelly." Unfortunately, it didn't fall to me to roast the turkey this year. But I know it would be delicious, so I will have to keep it in mind for the next time it is my turn to host the big meal. Cold, gray days...perfect for soup...are never in short supply in late November. Drain and rinse the beans. Place them in a large saucepan and cover with fresh water by 2 inches. Bring to a boil. Lower the heat and skim off the foam that has risen to the surface. Add a generous drizzle of olive oil, the garlic and thyme. Cook the beans at a gentle simmer, stirring occasionally, until the beans are tender. Or, place the soaked, drained beans in a shallow gratin with the garlic and thyme. Drizzle with the olive oil. Cover with boiling water by an inch, cover the pan with a tight fitting lid, or a piece of foil. Transfer to a 325° oven and bake until tender. Whether you cook the beans on the stove top or in the oven, they will take about an hour and 15 minutes to cook. Add salt to taste when the beans are half cooked. Beans may be cooked ahead. Cool the beans in their cooking liquid. Add the turnip, sweet potatoes and cabbage and stir to coat in the fat and cooked vegetables. Add a good pinch of salt and continue to cook, stirring occasionally until you can hear the vegetables sizzling and see that the cabbage has begun to wilt/soften. Add the stock and enough water to just cover the vegetables—they should be snug, but move freely and easily when stirred. In any case, the amount of liquid is up to you. Use less water if you want thick, hearty soup and use more if you want a lighter, broth-y soup. Be mindful that the cabbage will collapse a bit as it cooks. Bring the soup to a simmer. Taste and season the soup with salt. Cover the pot, leaving the lid slightly ajar. Simmer, stirring occasionally, until the vegetables are just tender—about 20 to 25 minutes. Add the cooked beans with their liquid. Return the soup to a gentle simmer and cook briefly (5 minutes or so) to allow the flavors to blend. Correct the seasoning, adding freshly ground black pepper, if you like. Serve drizzled with olive oil and sprinkled generously with parsley. Serve with a loaf of crusty bread and some cheese.